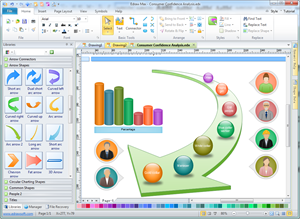 Draw arrow diagrams by starting from smart and special templates. Handle it easily in automatic and powerful software. When you want to showcase the steps of the project or process, their sequence and how long each step takes. When you need to demonstrate the composite, ingredient or structure of something . It is highly recommended to make your arrow diagrams in automatic diagramming software like Edraw. No drawing is required so that you can save a lot of time and energy. Furthermore, it offers a wealth of templates on various styles. You are sure to find a suitable one to get jump start. Its interface is similar with Word program, eliminating the learning curve. Almost anyone can use Edraw to make amazing arrow diagrams in a breeze. Edraw offers many styles of templates to draw various kinds of arrow diagram, such as circular, divergent, highlight and multi-arrow style. The circular style is suitable for showing circulatory process. 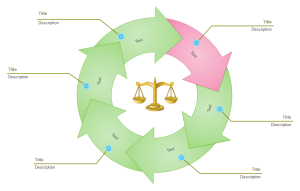 The divergent style is useful for illustrating one main idea from several perspectives. Highlights shapes are more impressive in terms of visual impact. With these rich templates, you can gain limitless possibilities for your arrow diagrams. Smart vector shapes which can be easily edited through clicking the floating quick button or dragging the control button. Special color, layout and style, making unique visualization like no other. Attached text box enabling easier information input. Built-in themes allowing one-click change of appearance and style. Ready-made examples for reference and immediate application. This simple arrow diagram template is quite useful for your own designs because it is smart with automatic functions of adding and deleting arrows. Learn how to gain such beautiful arrow diagrams in the quickest and easiest way. This template is quite unique with rectangle shapes. Everything is well prepared. Every detail is well dealt with. 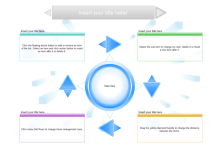 Just create wonderful diagrams, deliver wow and marvel your audience.